This CD has received a Gold Record from the Australian Recording Industry Association (ARIA) for sales of more then 40 000 copies. Because of this it is widely regarded as one of the best hypnosis stress management programs available. This CD contains a 5 minute spoken hypnotic induction and then continues with the gentle sound of theta rhythm only, for the remaining 50 minutes of the recording. Welcome to the new calm, focused and relaxed you! Let the special frequencies and short guided hypnotic introduction on this audio program take you to a place of tranquility and pure relaxation. Float with the gentle theta rhythm and F Sharp frequencies to guide yourself away from any negative thoughts, conflicting emotions and stress. The frequencies on this hypnosis CD or MP3 are designed to balance your mind and body to achieve equilibrium within yourself. These Neurosonic frequencies are proven, through the use of an Electroencephalography (EEG) machine, to drop the brainwave frequencies into theta state, wherein you will experience an incredible relaxing and calming feeling. The benefits of deep relaxation on a consistent basis are scientifically proven to make you physically healthier and emotionally stronger and reduce stress. This CD or MP3, if used everyday, will introduce these positive benefits into your lifestyle, to ensure that stress and anxiety problems are a thing of the past, and you can move forward to becoming a more successful and happy person! Don't let stress drag your life down - take action and try this amazing product today! Thank you so much. I had a chance to try one or your programs at a friends house and I was very happy with the results. I've explored the self-help/hypnosis/Hemi-Synch/Hypno-Peripheral Processing/NLP/Etc/Etc/Etc world for twenty five years, I can tell when a program is working and when it's not. That's why I decided to buy from you. Many thanks for your reply which was of great help to me. I already have about five of your CD’s and I am just about to make an on-line order for one of Tania’s CD’s for my wife and one of your titles for myself. I think that they are terrific works. I couldn’t find an answer for this so I thought that I will email and ask. I am currently on an IVF program and I have been listening your Stress Management CD in regular basis before the treatment started. What I am wondering is that is it safe to listen also after the embryo transfer when waiting that pregnancy would hopefully start? I was just wondering if theta rhythms are safe also for the possibly developing embryo? Or is it better to use another type of relaxation method in this situation? Your stress management Cd has helped me a lot since I found it from Borders. It has helped me to sleep better and be more relaxed. Thank you so much for bringing these CD series for sale. I have been using several of your cd's and i find them excellent. I have the weight loss, life potential and stress management cd. I find them much more powerful and effective than others i have tried. First of all, I wanted to express my deepest gratitude. 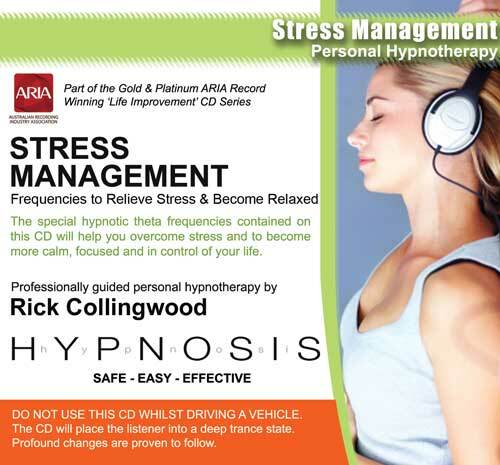 I have been using the Stress Management Cd for a few months now and haven’t been sleeping this well in the past 20 years. In my case I would assume I have a “superactive” mind which wakes me up even at nights, feeling like my thoughts are going 160km/h straight after opening my eyes. This has mainly stopped since starting to use your Cd in regular basis. Related to this, my father has the same problem, but he has been suffering about insomnia for the past 30 years at least and thus worries many things during nights. The only thing which gives him some relief and sleep is taking sleeping pills. I would like to find a similar type of Cd to him to listen, but in this case I am curious to hear if you know where I should look as my father talks only Finnish and I would assume subliminal messages are in English? This question might sound stupid, but I thought that I will still ask it in case listening the theta rhythm could still help him? Or can you advice any other things he could try?